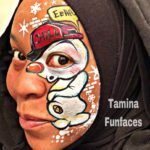 Tamina Muhammad is an award-winning illustration artist and professional face painter. She studied illustration at Pratt Institute Manhattan N.Y. She was born in East Orange N.J. and has been residing in The Twin Cities with her family for 4 years. Tamina has been drawing and painting since childhood. She is inspired by the world around her. She works in various mediums. She loves to design art that tells stories and is a reflection of her multi-cultural heritage. Her art is influenced by artists such as Tim Burton, Picasso, Lady Pink, Bob Ross, Bill Cosby, Walt Disney and so many more. Her goal is for her art to awaken the imagination through her unique creativity and relate to the viewer through various bold colors and humorous expressions. Tamina art has been showcased and published in a few Face Painting magazines, galleries, cafes, museums, numerous competitions, clothing lines, record covers, internationally and online stores. She has been an inspiration to artist around the globe. She enjoys teaching youth in the inner cities as a lead artist for the Art Mobile through East Side Arts Council in the spring and summer. She believes the greatest gift is giving back and sharing art to help others believe in themselves and to inspire and be inspired. I am honored to be invited to teach at FPBA Convention this year. I’ve been face painting since 2011 and over the years have developed my own style. I have a very unique and distinctive style that is bold, colorful and fun for all ages. I bring a lot of sassiness to my designs and my characters. I add my street art background with my illustration techniques and stencils to complete each design. You will learn how to give your designs and/or characters more spice and funkiness with placement, expressions, and how to add your own unique flare. People of all ages love my designs and they will love your designs too even more.